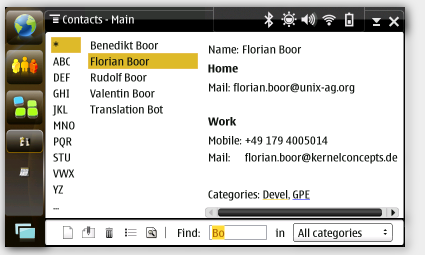 GPE was the first Open Source project for creating a graphical user interface framework for mobile devices using X11 and GTK+. Apart from these GPE oriented on standards and suggestions from freedesktop.org such as GStreamer and DBUS. GPE is using mostly GPL and LGPL licenses similar to Gnome. The project was started in late 2001 by Nils Faerber. Even not being that actively developed GPE has a quite interesting set of applications and libraries running on various devices. Most GPE applications work with multiple screen sizes in regular GTK+ environments or in the Maemo platform used by the Nokia Internet Tablets such as 770, N800 and N810. 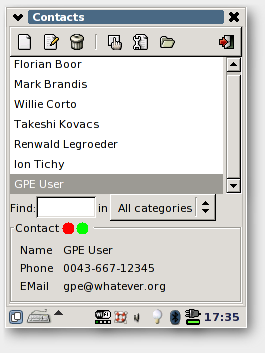 This is GPE's contact manager application (gpe-contacts) running on a typical PDA screen (QVGA resolution: 240x320 pixels). The same application with slightly different user interface layout running in Maemo 4.0 at 800x480 pixels.